Splenic tuberculosis (TB) is a rare form of extrapulmonary TB, which usually seen as part of disseminated TB, especially in immunocompromised patients., Their clinical and laboratory findings are nonspecific as they simulate other infectious diseases. The early diagnosis of this condition is crucial since a late diagnosis or that is overlooked can cause fatal complications. Herein, we report a case of disseminated TB with spleen involvement to increase physician's awareness of this rare form of extrapulmonary TB in immunocompetent patients. A 23-year-old Indian male patient with no reported significant medical history presented to the Accident and Emergency department with a 10-day history of left-sided abdominal pain and fever. Abdominal pain was dull in nature, moderate in intensity, radiating to the back, exaggerated by movement and relieved in sitting position, associated with low-grade fever and weight loss. He also reported a 1month history of dry cough. On physical examination, the patient was looked ill, febrile with temperature of 38 × 2°C, pale but not jaundiced. Abdominal examination revealed a tender splenomegaly about 7 cm below costal margins, while the rest of his examination was unremarkable. Laboratory investigations showed a microcytic hypochromic anemia with hemoglobin of 9, 8 g/dl. His white cell count, platelets, blood biochemistry, and liver function tests were within normal range, and HIV testing was negative. 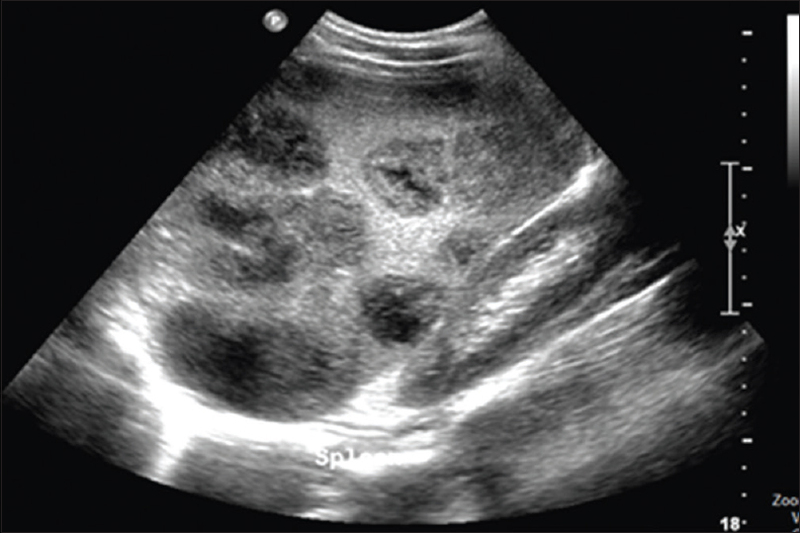 The patient underwent an urgent ultrasound of the abdomen that revealed an enlarged spleen measuring 17 cm with multiple complex cystic lesions, the largest of which measured 5.3 cm × 5.2 cm [Figure 1]. Computed tomography (CT) of the abdomen showed an enlargement of the spleen with multiple hypodense lesions, some of them with septations, the largest measuring 6.9 × 5.4 cm, in addition to multiple lymph nodes in the perigastric, retrocaval, pericoeliac, precaval, hepatic, and preaortic regions [Figure 2] suggesting splenic infection. 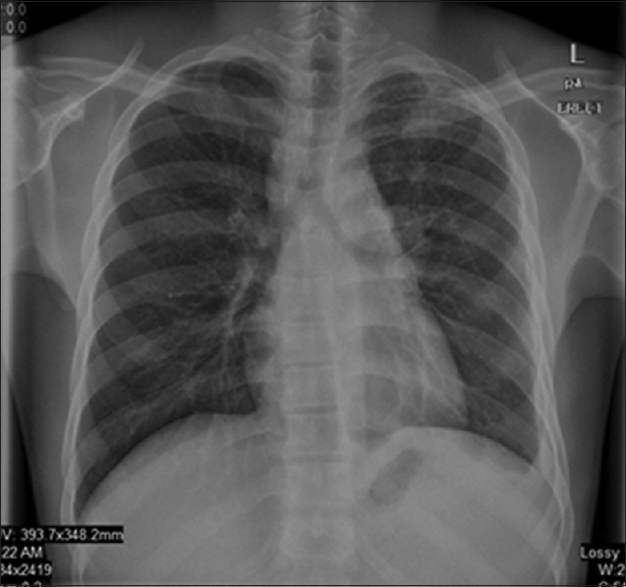 Chest X-ray showed left apical fibro-nodular infiltrate with prominent left hilar region suggestive of enlarge lymph node [Figure 3]. Based on these findings, the possible diagnoses were splenic pyogenic abscess, splenic TB abscess, and splenic lymphoma with superimposed infection. The patient was started empirically on broad-spectrum antibiotic (piperacilline/tazobactam) and was admitted and kept in a TB airborne isolation room. Sputum for acid-fast bacilli (AFB) was positive as well-purified protein derivative skin test. Therefore, the patient was diagnosed as disseminated TB with spleen involvement. Antibiotic was discontinued, and a 4-drug anti-tuberculous medication (isoniazid, rifampicin, ethambutol, and pyrazinamide) regimen was immediately initiated. On the following days, the fever and abdominal pain subsided and 2 weeks after admission, the repeated sputum smear for AFB was negative on 2 consecutive days. Hence, airborne isolation was suspended, and the patient was discharged on quadruple therapy for 2 months followed by two-drug regimen for another 4 months, and he was advised to follow the TB clinic regularly. Mycobacterium tuberculosis was grown after 32 days and was sensitive rifampicin and isoniazid. 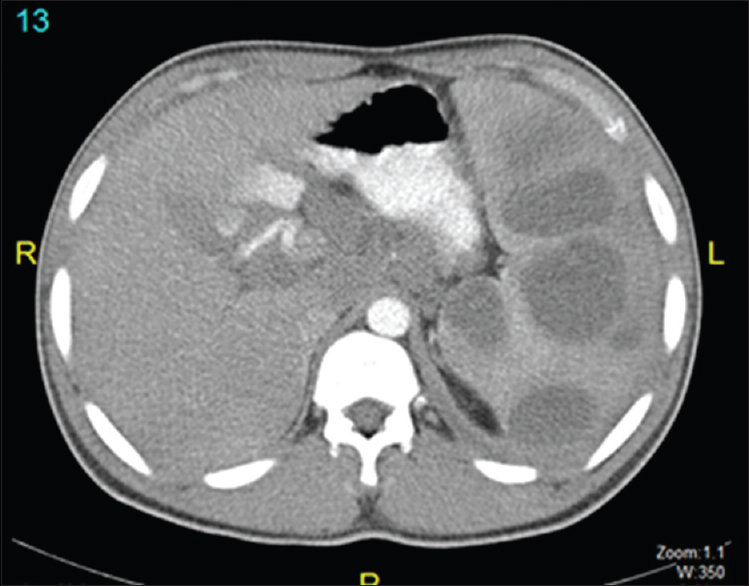 A 7-month follow-up abdominal CT showed a complete regression of the splenic lesions and a complete resolution of the symptoms. With this result, the diagnosis of disseminated TB with spleen involvement was made. Splenic TB is usually identified by radiologic investigations; however, fine-needle aspiration, splenic biopsy, or splenectomy is required to confirm the diagnosis. The specimen should be subjected to smear AFB, polymerase chain reaction, and culture methods for isolation of M. tuberculosis as well as histopathology examination for detection of caseating granulomas.,, In our case, ultrasound and CT scan demonstrated findings, which were similar to those seen in any bacterial or fungal infections. A splenic biopsy was not performed since the sputum for AFB was positive, and the diagnosis of splenic TB was retrospectively confirmed after treatment completion and resolution of splenic lesions as shown by the complete regression of the splenic lesions on the follow-up CT of the abdomen, confirmed the diagnosis. Splenic TB should be included as one of the differential diagnosis of splenic mass in immunocompetent as well as immunocompromised patients from areas endemic for TB, especially when the patient presents with upper abdominal pain, fever, and splenomegaly. Antituberculous treatment is the first-line therapy with relatively good outcomes. Imani Fooladi AA, Hosseini MJ, Azizi T. Splenic tuberculosis: A case report. Int J Infect Dis 2009;13:e273-5. Kumar S, Pai AG, Tungenwar PN, Bhandarwar AH. Isolated primary tuberculosis of spleen – A rare entity in the immuno-competent patient. Int J Surg Case Rep 2017;30:93-6. Adil A, Chikhaoui N, Ousehal A, Kadiri R. Splenic tuberculosis. Apropos of 12 cases. Ann Radiol (Paris) 1995;38:403-7. Amin Soliman MA. Splenic tuberculosis – A rare case report. Glob J Med Clin Case Rep 2017;4:72-3. Joshi S, Bankar M, Kagal A, Rane S, Bharadwaj R, Phadke M. Splenic tuberculosis – A rare case report. Internet J Med Update 2007;2:38-41. Dixit R, Arya MK, Panjabi M, Gupta A, Paramez AR. Clinical profile of patients having splenic involvement in tuberculosis. Indian J Tuberc 2010;57:25-30. Pottakkat B, Kumar A, Rastogi A, Krishnani N, Kapoor VK, Saxena R, et al. Tuberculosis of the spleen as a cause of fever of unknown origin and splenomegaly. Gut Liver 2010;4:94-7. Masoodi I. Splenic tuberculosis: Report of two cases and literature review. BJMP 2017;10:a1001.